The Hills Sports (Sydney) 1 (Bethany Gordon 19m) beat Hunter Sports (Lake Macquarie) 0. 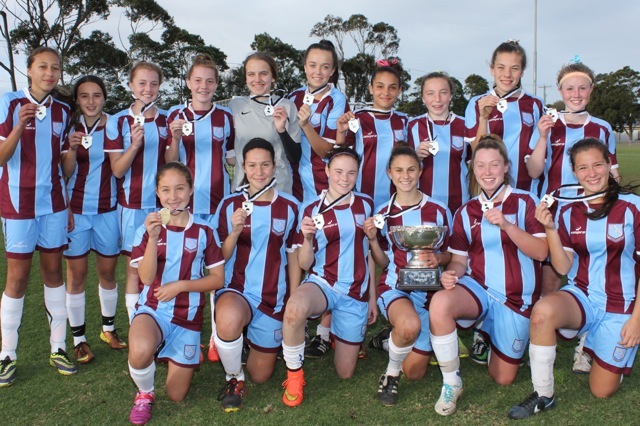 Spirit of Football: Christina McGrath (Westfields Sports High). Westfields Sports (Sydney) 6 (Panayiota Petratos 3m, 7m, 25m, 60m; Courtney Nevin 1m; Rosaria Galea 47m) beat Kirwan State High (Townsville) 1 (India Kubin 30m). The Hills Sports (Sydney) 7 (Bethany Gordon 5m, 10m, 36m, 45m; Eliza Ammendolia 19m, 50m; Danielle Keller 57m) beat Kirwan State High (Townsville) 0. Hunter Sports (Lake Macquarie) 3 (Ashlee Brodigan 1m, 44m; Kobie Ferguson 48m) beat Westfields Sports (Sydney) 1 (Princess Ibini-Isei 15m). The top 8 in the Bill Turner Trophy (girls): Kirwan, St Peter Claver, St Josephs East Gosford, The Hills Sports, Alstonville, Hunter Sports, Westfields, and Albury. Cairns, Kirwan, Downlands, Harristown, Chancellor, Mt Alvernia, Cavendish Road, St Peter Claver, St Josephs East Gosford, Kirrawee, St Marys Star of the Sea, Vincentia, Oxford Falls Grammar, Cherrybrook Technology, The Hills Sports, Bede Polding College, Alstonville, Xavier Ballina, Coffs Harbour, Carinya Christian, GLC Forster, Maitland Grossmann, Hunter Sports, West Wallsend, Canberra Girls Grammar, Maribyrnong College, Westfields Sports, Freeman Catholic College, Marian College Griffith, Albury, Red Bend College Forbes, Mackillop Catholic Bathurst. Winning coaches must communicate results to the Area Managers, John Cavanah, Good Counsel College Ph O419617390 Email [email protected] or Paul Bruce, Ignatius Park College Ph 0408798793 Email [email protected] NB. Slight variations to this draw can occur. In such cases the relevant schools will be notified by the Area Manager and the website will be updated.Teams are welcome to write a brief match report on their game and post on the Facebook wall. Include the team names, and names of goal scorers etc, but please avoid criticism of any player, team or official. David Donaldson (Beaudesert SHS) Ph 55429147Fax55429100 [email protected] NB. after each match.NB. Slight variations to this draw can occur. In such cases the relevant schools will be notified by the Area Manager and the website will be updated.Teams are welcome to write a brief match report on their game and post on the Facebook wall. Include the team names, and names of goal scorers etc, but please avoid criticism of any player, team or official. Winning coaches must communicate results to the Area Manager: Nathan Edwards(Beaudesert SHS) on Ph 07 55429100 Fax 07 55429100 Email [email protected] after each match.NB. Slight variations to this draw can occur. In such cases the relevant schools will be notified by the Area Manager and the website will be updated.Teams are welcome to write a brief match report on their game and post on the Facebook wall. Include the team names, and names of goal scorers etc, but please avoid criticism of any player, team or official. Winning coaches must phone results to the Area Manager, Peter Maltby Home phone and mobile as advised to coaches. [email protected] after each match. Completed team sheets to be forwarded to him within two days.NB. Slight variations to this draw can occur. In such cases the relevant schools will be notified by the Area Manager and the website will be updated. Winning coaches must communicate results to the Area Manager, Steve Ross (Maitland Grossmann HS) on Ph 02 4934 2066 Fax 02 4934 5086 [email protected] after each match.Completed team sheets to be forwarded to him within two days.NB. Slight variations to this draw can occur. In such cases the relevant schools will be notified by the Area Manager and the website will be updated. Winning coaches must communicate results to the Area Manager, Greg Pell- James Sheahan HS Ph 02 6362 1422 Fax 02 6362 0776 [email protected] after each match. Completed team sheets to be forwarded to him within two days.NB. Slight variations to this draw can occur. In such cases the relevant schools will be notified by the Area Manager and the website will be updated.Teams are welcome to write a brief match report on their game and post on the Facebook wall. Include the team names, and names of goal scorers etc, but please avoid criticism of any player, team or official. The Bill Turner Cup and Trophy Finals are on September 2 and 3, at the Darling Street Oval, Hamilton South, Newcastle. The semi-finals will be played that afternoon/evening at the Darling Street Oval. Spectators are most welcome – free entry. Canteen on site. No alcohol please. The finals will be played the next day, following third place playoff matches. Following each match there will be presentations of medals and awards. More detailed information here, including game times and map of locations.This will be the 36th year of the Bill Turner Cup, but it will be only the second time Bill Turner hasn’t attended. Bill passed away peacefully in February 2013, aged 83, after a short battle with cancer.